Chelsea Royoko Wong, "Rock and Roll, Jaguar Sedan," 2018, gouache, watercolor and colored pencil on paper, 30 x 22"
Regional art is constantly under redefinition, as Chelsea Ryoko Wong’s current exhibit affirms. Her mixed-media paintings tackle the street life of neighborhoods in San Francisco. As a result, Seattleites and others get a window into the marvelous multi-cultural panorama of that city’s ethnic, sexual and gender diversity. 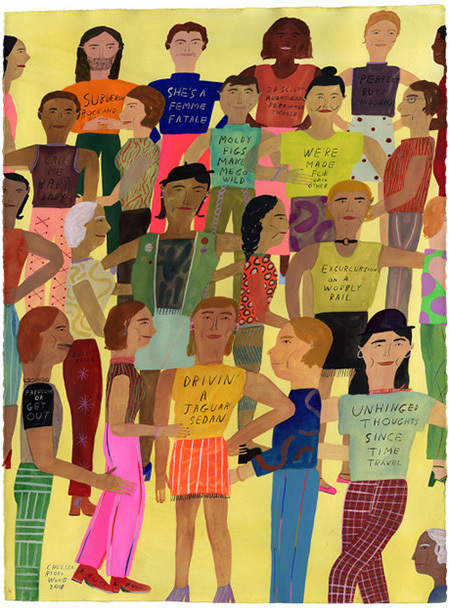 Working in a simplified, illustrational style similar to The New Yorker’s Maira Kalman, Wong’s tightly focused subject matter is brightly colored, crowded with the people of urban venues: senior centers, yoga classes, ballet classes, demonstrations and parties. Akin to Jacob Lawrence in Harlem or Ben Shahn in New Jersey, Wong sees a population of idealized cooperation and feel-good vibes without recourse to unpleasant realities that lurk elsewhere in San Francisco’s complicated, frustrating mix. In “Rock and Roll, Jaguar Sedan” every imaginable gay male stereotype is represented, from butch to femme to transgender men/women. Wearing skirts or work shirts, shorts or jeans, the boys are linked in shared enthusiasms and love for one another. However, the solidarity of straight and gay women is the prevalent theme throughout. “Capote’s Girls,” “Reasons to Live and Love” and “Love in a Mysterious Japanese Mexican Modern Garden” celebrate lesbian friendships while “People of the World,” the largest work, joins men and women, straight and gay, in a group portrait with the shallow pictorial space and carefully colored composition that makes all her art so readable and direct. “Limbo for the Ages” and “Youthful Incantation” adapt Egyptian hieratic compositions with women in profile or a conga-line format. Personal anecdote, community occasions, travel memoirs, and optimistic yearning for peaceful co-existence permeate the grouping, reinforcing the specialized and local aspects. Traveling beyond the Bay Area, Wong’s sensibility is what animates otherwise inert presentations of collective joy.